If you want to compete for the Weekly Winners badge, click answer at the bottom of this post, and let us know. Please include your time zone (GMT standard) and any teams in which you are a member (not required). If you just want to join us but not compete, click comment and let us know you here, then feel free to cheer the others on. We have decided to use the Challenge Tracker to record the profiles we sources. You can continue commenting in your answer regarding successes, discrepancies, stories that tug at your heart strings, and new amazing sources. We also have a Google Hangout if you'd like to join us. It will be as busy or quiet as we make it. All profiles improved must come from the Unsourced categories or be already present on WikiTree and unsourced - you cannot create new profiles and add sources just to up your tally. The hope and goal is to improve the profiles already on WikiTree which need sources. Other great ways to find unsourced profiles are to check out orphaned profiles and use the Unsourced by Country lists which Aleš prepares for us. If the only source is a link to a profile is a profile or search results page from another genealogy website or the words "Ancestry tree," "Geni.com," "Pedigree Resource Files" from FamilySearch, and the like, the profile is considered unsourced. If you add better sources to the profiles, use the Challenge Tracker to include it in your tally. If you find a source listed on a profile page at another genealogy website or at tertiary website sources such as Wikipedia, ThePeerage.com, Rootsweb, etc., track down the real source, add it, and include it in your tally. If you don't have time or know how, see the next point. "Searched Google for an obituary and didn't find one." Remember, your sources need to be as full and specific as possible, so others find them useful. That means, if the source is online, you should link to it. If it is a page from a book, the page number should be included so others can easily see where you found the reference. The tally is of profiles improved, not sources added. That said, if you can add a number of sources to a profile, all the better. If you find a match and can merge a profile into an already sourced profile, that counts too. You still found a source, plus you eliminated a duplicate. To get to the Challenge Tracker for these, clean up the merged profile and then click the Challenge Tracker. When you save the profile, a green bar will appear at the top. Click the Challenge Tracker button, add or verify your WikiTreeID, select a pre-defined comment or add your own to indicate which type(s) of source(s) you added, put a check mark in the "Saturday Sourcing Sprint" box, and click "Add Action." If you participate in the Monthly Sourcerers' Challenge you can click both boxes. The Sprint tracking page will be updated after the sprint is over. 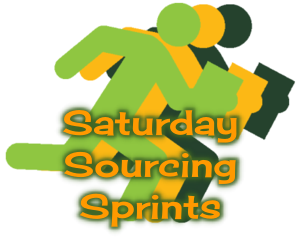 Once that is done, a best answer will be awarded to the Sprinter who sources the most profiles and, if it is the first time winning, the Saturday Sourcing Sprints Winner badge will be awarded. You can track your progress on the Challenge Tracker report. Remember, if you don't want to compete for the Weekly Winner honor, comment on this post. Only those who create an Answer will be eligible to win. Challenge Tracker has been tested as of 11:58am EST and is working for the Sprint. Please let me know if it does not work in your time zone when you start. Thanks! Hi Debi, I'm in for the running! I'm here, cheering folks on! I have to share my first Sprint giggle of the weekend. There are 48 gggrandparents whose lines I work. Each weekend, I have my husband to pick a number from 1-48 and then work on that surname for the Sprint. This week he picked 3 ... the same number that he picked last weekend. Looks like I'll be sourcing some more Hinsons. We sourced a total of 637 profiles on Saturday to bring our count for the year to 9499. Jason Cotrell won his first Saturday Sourcing Sprint with 182 profiles sourced. We were joined by a couple of new Sprinters and a few more who didn't register. The Sprint tracking sheet (yearly totals) has been updated. If we keep this momentum up, we will easily surpass my stretch goal of 10,000 by the end of the year. I am so appreciative of all the hard work each of you does to make our WikiTree better. I will be doing some...hopefully many! GMT+0. Way to go, Jason, with 182 profiles sourced this past Saturday to take the Weekly Winners badge which I've just awarded.Thank you! Thanks Debi. I was in the UK to look after my father, who by doing the initial research on our family got me into this in the first place. So, this is for him. Welcome to the Sprints, Rianne. You've done the first part right by adding an answer. Now all you have to do is wait for it to be Saturday where you live and then find sources. Let us know if you have any questions. I'm in for another Saturday. Welcome back, Deb, great to have you join us! Hi, I would like to try the sprint today. CST GMT-6. Great, JoAnn, we're grateful for all the help we can get. I am in for what I can do. It's late, but I'm in for whatever I can do before midnight!